Sir Edward Feathers, known as Old Filth (Failed In London Try Hong Kong), reflects back on his life in Old Filth by Jane Gardam. Recently widowed, his finds himself at loose ends and tries to make connections with his past. Feathers was a Raj Orphan, born in the far east and sent to live with strangers in Wales in the years between the two wars. His is a life slowly revealed. It is a case of appearances being deceiving. He lead a seemingly uneventful life. Near the end of his life, he finds himself widowed and apparently friendless. Although he had a distinguished career and became quite wealthy, most in his profession viewed him as legendary and supposed him to be already dead. His marriage was childless and sexless. He did not see front line service in World War II, rather he was a bodyguard to Queen Mary. This quiet man, plagued with a stammer, reveals himself as he reflects back on this life. The truth is layered and surprising. He is a survivor of an era and and empire that no longer exists. 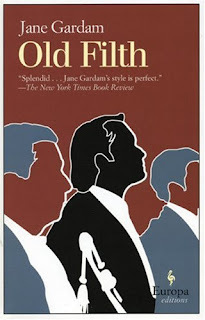 Old Filth was shortlisted for the Orange Prize in 2005. Gardam was inspired in part by Rudyard Kipling's autobiography Something of Myself which tells about his early life in Ceylon and his own miserable experiences as a Raj Orphan. The Rain Before it Falls by Jonathan Coe is another story which reveals family secrets while reminiscing in old age. Feathers in Old Filth says that he was never loved as a child and as a result could only have damaged a child of his own. In The Rain Before It Falls we see the tragic consequences of violence on generations of a family. However, while this book is fairly intense in tone, Old Filth is really quite funny. Another book which reflects upon the effect of war on life in England is The Lost Garden by Helen Humphreys. During World War II Gwen Davis volunteers in the Devon countryside overseeing a group of girls who grow crops for the war effort.